Exceptional Anti-Wrinkles, Anti-Puffiness, and Anti-Dark Circles. 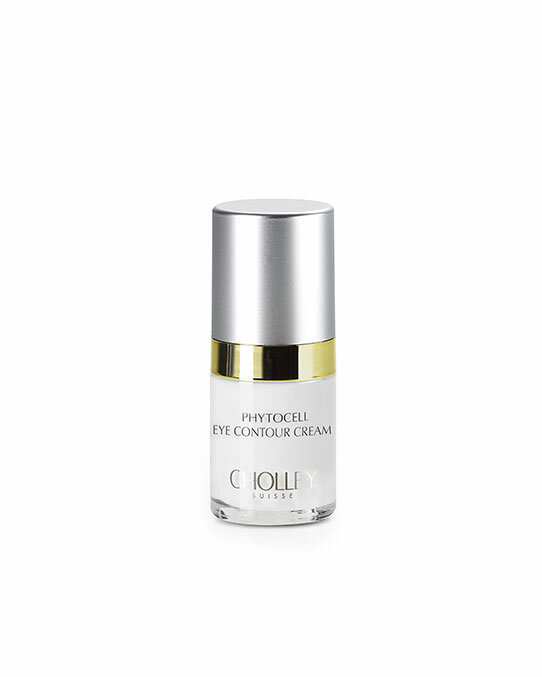 In the morning and especially in the evening, after thoroughly cleansing the face, apply CHOLLEY Phytocell Eye Contour Cream to the eye contour area with a delicate massage. On the eye orbit region proceed with light semi-circular movements towards the external corners of the eyes. For the temple region use radiating movements away from the external corners of the eyes. For sagging upper eyelids use a very small amount of the cream, in the unlikely event of heaviness or discomfort avoid upper eyelids. For dark circles and puffiness use a draining massage as follows: Start with your index finger in the center of the lower eyelid. With light rolling movements of the fingertip apply a small amount of the cream going slowly from the center towards the external corner of the eye. In the same manner repeat the application going from the center towards the internal corner. Repeat the movements several times to ensure optimal penetration of the cream. In case of an accidental contact with the eyes, rinse well with cold water.